Among the opal traders, the definition of Black Opal varies. We believe it should be like this. "Black opal must comes from Lightning Ridge and has a black or grey base colour". Boulder opal are called "Queensland black opal" by some jewellers and retailers in some countries. This is not wrong, but it is quite confusing. The cause of the confusion probably comes from the rarity of the Black Opal. Also in particular Gemological Association said the opal without black backing can not be called Black Opal, even it has a black body colour and comes from Lightning Ridge. The opal must be from Lightning Ridge. 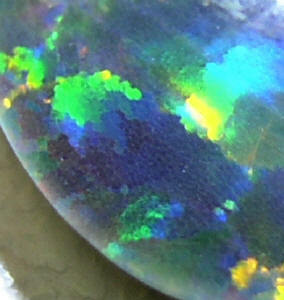 The body colour of the opal must be naturally black or grey. We were mentioning about Doublet and Triplet opal in HOW TO. There are more types of synthetic opals, so we are going to talk about these type of opals in this chapter. Most famous synthetic opal is called "Gilson Opal". This name comes from the person who's invented this synthetic opal. Its presentation is very similar to natural opal and also chemically similar too. So it's a bit hard for people to distinguish them. But don't worry too much. If you are familiar with opals and you have a loupe, you can see the difference between Gilson opal and natural opal. Once you see the edge of each colour by using a loupe, you can find Gilson opals very rough like a mosaic (called "Lizard Skin"). The next one is called "Slocum Stone". This is not actually synthetic but imitation. It is a glass embedded by fine coloured tinsel like threads. Some other imitation opals are also on the market nowaday. So you have to be careful and always ask your trusted jeweller or retailer before buying. One more thing we have to mention is about an "Enhancement". It means to help to bring out its inner beauty by special way. Among the jewellery industry it's very popular way to make the stone much better presentation and it's recognised as a natural stone. But another similar way called "Treatment" is totally different and does not recognise as natural, and must be always put the word "Treatment" on the certificate. Treatment is the way of putting the additional character which the stone doesn't have, like put the blue colour to a white diamond (make it a blue diamond) using radioactivity. This is one way of totally changing the character of the stone, so this is not natural. Both "Enhancement" and "Treatment" mean the same things to all gem stones (make it more beautiful) but it's not the same for the values of that stone. In other word, let's say "Enhancement" is put on a make up and "Treatment" is to have a cosmetic surgery (is this easier for you to understand ?). Enhancement is very popular to some colour stones like rubies, sapphires or aquamarines. These gems usually have some enhancement to better the presentation of the stone, before cutting. How about the opals ? We sometimes see opal, which is actually white or Mexican opal but looks unnaturally black. These opals have been treated that means they have been heated to make them look like black opal. You can easily identify these from natural Black Opal. It looks so different. On the other hand, "Enhancement" is prepared like this. When making a ring or pendant, an opal which has strong transparency (sometimes called Crystal Opal) is backed by material like gold to make the colour more vivid. This is called "Enhancement". The stone has not changed its character but improve its presentation. Of course if you compare the price between this kind of Enhanced opal and non enhanced Black opal, you can find the difference. The enhanced opal are much more affordable. So, this is a great alternative for people looking for an attractive piece of opal without spending the price demanded by Black Opals. We have these enhanced opal as our products for samples only, and when we show this kind of opal to our clients, we always tell the fact that it has been enhanced and it's not for sale. Thank you for associating with us. We hope that we have given you a better understanding and provided you with more information about opal. Especially Black and Boulder opals. It is very hard to see many at once because they are so rare. It will be much easier for you to understand if we had these pieces in front of you. Opal is the national gem stone of Australia. We have been introducing this beautiful and precious gem, and about this amazing country, Australia. We hope that more people are willing to know about opals and Australia as much as possible. If you have any comment or question, please send an Email to us. It's much appreciated.